Musical notation made easy for everyone. When I first heard that Notion Music had dropped the price of its musical notation editor and scoring package from $249 to $99, I thought that the company was getting ready to close shop and having a fire sale. Or they'd gone crazy. Apparently, however, the company's experience with the iPad version of Notion has convinced them that selling more programs at a lower price might make them more money. Whatever the reason, it's nice to know that the slickest score editor on the planet is safe, sound, and improving. Both the Notion interface and its onscreen notation are eye-candy. The first thing you'll notice when you run Notion is how good-looking everything is. The interface, the pages, the notation, the musical symbol palettes, etc. are all rendered in a very inviting style. The program simply makes you want to compose. It's also easy to use compared to most of the competition. I have a long-standing beef with the notation software industry's lack of true drag-and-drop editing. Notion doesn't support it either, but its editing methods are slightly more intuitive than those employed by Sibelius, Finale, or MuseScore, so editing is easier with Notion. 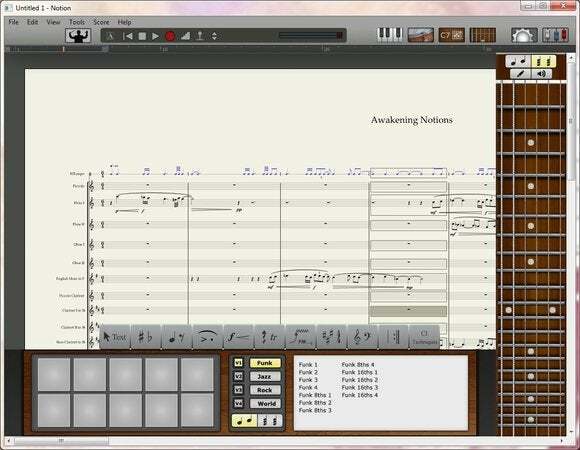 Notion 4 has three excellent virtual instrument grids: a guitar, a piano, and a drum pad which allows you to enter notes. Notion Music's more guitar-oriented Progression featured a guitar, but these are new to Notion. The piano and guitar feature a preview mode so you can try things before you enter them, and both let you enter melodies or chords. If you're instrument-dependent, these are very useful features. The drum pad features a library of rhythm patterns you can drag to your score, but doesn't have a preview mode as the piano and guitar features. Sound is another of Notion's strengths. The orchestral instruments were played by members of the London Symphony Orchestra and recorded at Abbey Road. There's about 6 gigs worth of them, and they sound very good. They even support most of the major articulations (staccato, legato, etc.). Notion also supports Rewire and VSTi so you can use third-party sample players, and there are inline presets for popular symphonic libraries such as Miroslav, Garritan, Vienna, and EWQL. Drum, piano, and guitar grids make entering notes easy for nearly everyone. One sound caveat: While the program includes most major instruments, missing are some staples such as classical guitar and jazz horns. You can easily compose with what's there, but there are enough missing that you might be tempted to grab some sounds from Notion's expansion packs. These run from $70 for a single-instrument pack, to $370 for all the available sounds. Other nice facets of Notion are its broad support for guitar tablature (tab) and its unique sequencer staff. Notes appear on a staff, but are shaped like the notes you'd see in a step sequencer. There's also a sequencer overlay which adds a velocity and duration shadow to regular notes. Notion also has a performance mode, called NTempo mode where editing functions are disabled and performance features come to the fore. I do have some minor nits to pick with Notion. I've already mentioned that there's no true drag-and-drop. Others include having only scroll bars and the mouse wheel available for scrolling the score (I'm not a wheel man), having to manually enter alternate string tunings, and no way to change the keyboard shortcuts à la MuseScore. Also, it would be nice to be able to enter notes from the grids while recording, which is apparently in the works. About the only area where Notion isn't as versatile as the competition is in fine-tuning the placement of elements. Basically, it doesn't. It creates wonderful-looking scores, but if you want to move a single accidental three millimeters to the left, you're out of luck. You can, however, change the overall spacing used by the automatic notation engine, which produces very nice-looking output. Notion also features a full-blown mixer with effects. At one-third (or less) the price of full versions of Finale and Sibelius, Notion 4 is bargain and then some. It sets no artificial limits as do the entry-level Sibelius First, and Finale PrintMusic which are priced similarly. The only real competition at this price point is the free MuseScore, which is as capable with the basics, if not nearly as elegant or rich in note-entry tools. Note: Notion was bought by Presonus and is now available from that company's Web site for $150. Now at version 6.1, the program's major improvements are handwriting recognition and tight communication with the Studio One DAW, though other minor tweaks and perks abound. The look has altered slightly to match the company's other offerings, but it's still every bit as friendly. 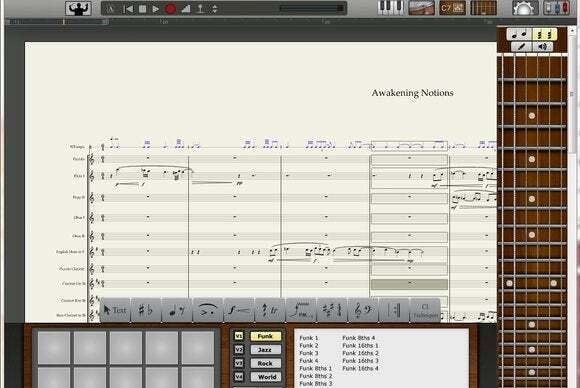 Notion 4 is a full-blown, unlimited and friendly musical notation editor at an entry-level price. Notion is probably the best combination of ease-of-use, power and affordability in the notation software market. Having been bought by Presonus, it now communicates with the Studio One music creation and recording package. The most salient recent addition is handwriting recognition for those that like to draw their scores using a touchscreen. The new look matches Studio One more closely, but the guitar, piano, and drum note entry grids--our favorite features--remain. The price is now $150 (up from $99), but it's still a steal. There's also a super affordable iOS version for use on the go.